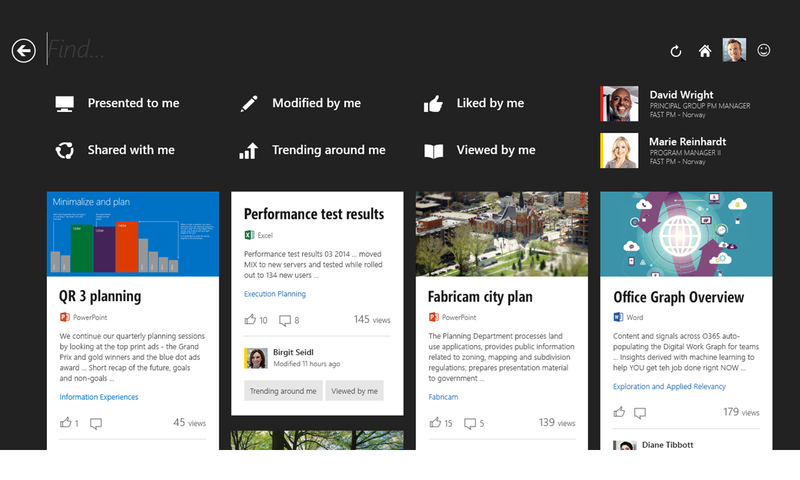 Microsoft announced a major update to Office 365 today that adds an intelligent, machine-learning powered social network and “intelligence fabric” on top of its productivity apps. This new ‘Office Graph,’ as the company calls it, will slowly find its way across all of the Office 365 applications, but for now, Microsoft is only offering a sneak peek with a wide roll-out planned for the second half of the year. Microsoft corporate vice president Jeff Teper told me he believes that this rollout marks the “most transformative release” of Office 365 so far and “the biggest step for Office 365 Microsoft has ever taken.” The idea here was to combine the cloud with big data analysis and social networking to rethink some of the most ingrained — and often inefficient — workflows in businesses today. “Today, the world has become a giant network where connections make information more relevant and people more productive. Most companies, however, are not working like a network, which we believe is vital for their ability to improve collaboration and respond to customers, competition and market changes,” Teper told me. The company made the announcement at its SharePoint conference in Las Vegas today. 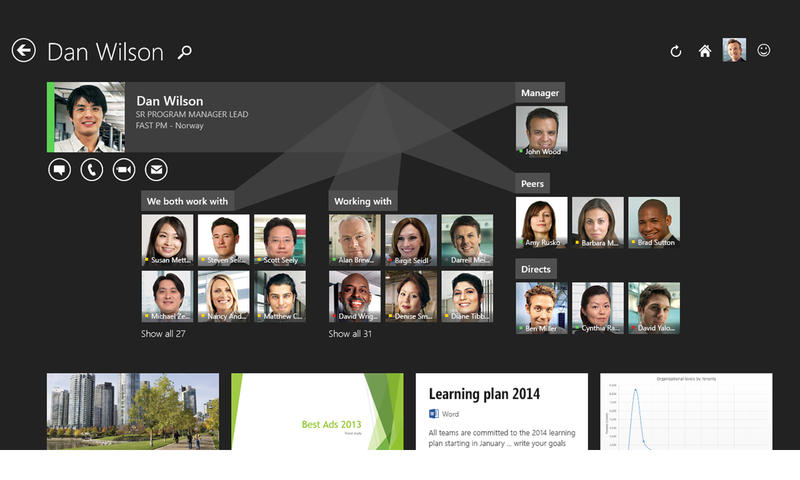 At the core of this transformation of Office 365 is what Microsoft calls the Office Graph. Using machine-learning techniques, the Office Graph looks at all the data it can find across the range of Office 365 services. Who do you talk to on Lync? Who do you exchange emails with in Outlook? What documents do you share in SharePoint and who do you share them with? Who is part of your Yammer network? Using this data, the system intelligently sets up groups for you — say for your marketing group or the people you are about to have meetings with. These groups then find their way into Outlook, where you can filter emails according to group, your calendar and other parts of Office 365. The first product that’s solely powered by the Office Graph is codenamed Oslo. This service takes all of this data and the groups you are part of and applies machine-learning algorithms to present you the information and documents that it believes are important for you right now. Groups, which are a new features in Office 365, can also be set up manually. 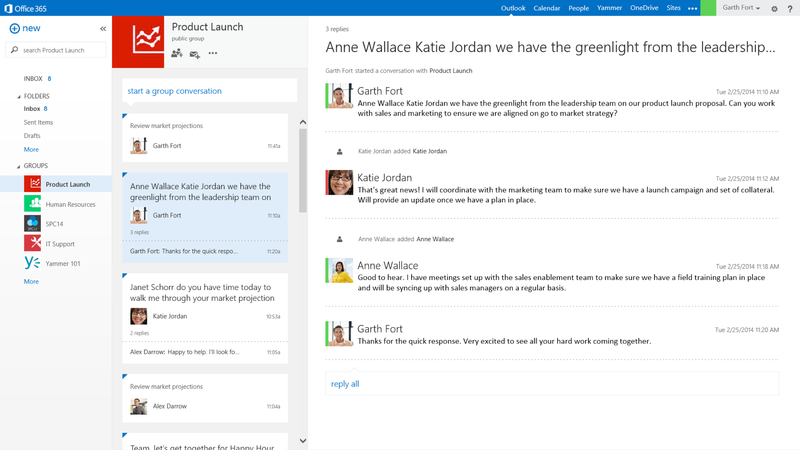 Every group gets its own Yammer conversation feed, calendar, document library and inbox. They are open by default, but can be made private. Microsoft recommends that companies that want to experience some of the power of these groups today set up Yammer groups for their employees, which should make the transition to the system-wide groups easier later on. Document discovery inside enterprises, Microsoft argues, is still hard and requires a lot of menial labor just to find the right document across what is often a multitude of shared drives and folders, both on premise and in the cloud. Oslo, on the other hand, is meant to present the right information to you at the right time. There’s no need to go searching for documents; Oslo will just present them to you. As Microsoft notes, you don’t have to change any habits to make any of this work (except for going into Oslo, of course). You still save your documents in the same places you always saved them and go about your daily routine. The machine-learning algorithms that power the Office Graph will simply learn from you over time and adapt to the way you use these tools. As part of this social networking initiative, Microsoft is also adding the ability to have social conversations inside documents in SharePoint Online and OneDrive for Business. OneDrive for Business (previously known as SkyDrive Pro), it is worth noting, is also getting its own standalone version for enterprises now. Microsoft is pricing this extremely aggressively, at prices as low as $1.50 per month/user for those with existing Office 365 licenses (and $2.50 for those without). This is meant for companies that want to keep their on-premise infrastructure intact, but still want to start moving to the cloud for file storage and sharing. OneDrive for Business will launch on April 1st. Also new in Office 365 is a video portal. This allows users to securely upload, store and find videos. As far as I can see, this is essentially a YouTube for the intranet, with the ability to categorize video into channels and all the usual streaming and video compression features you would expect from a hosted video library.